The camp houses 4,500 people in conditions described as "appalling." For years, thousands of people have been immigrating there from Africa and the Middle East in the hopes of reaching the U.K. underneath the sea, using the Channel Tunnel. Hundreds of people move along the highways nightly to try to smuggle their way in by hiding in trucks, cars or trains. 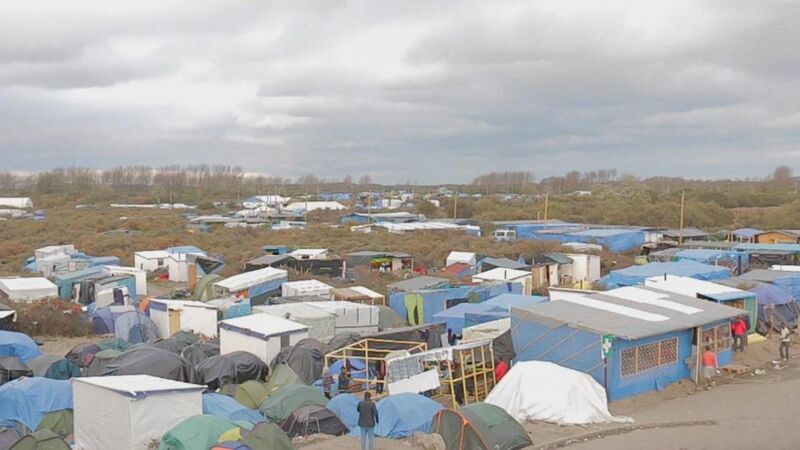 With the increasing number of individuals fleeing war and arriving in Europe – 1 million so far this year, according to the International Organization for Migration -- the pressure on Calais is greater than ever. (ABC News) ABC News spent a day with migrants and refugees in Calais, northern France. A Sudanese teenager was hit this month by a van and died close to the Tunnel entrance, becoming the 18th victim from from the camp since June. More than 800 migrants and refugees attempted to enter the tunnel terminal last week before being dispersed by police, officials told ABC News. Up to 50 shops and restaurants have set up business in the camp, selling meals and goods for a couple of euros. There are barber shops, nightclubs, bike repair shops and a bakery, among others. Volunteers have installed medical clinics, bathrooms and a women and children’s center. Dozens work tirelessly to help improve the living conditions in the camp, distributing blankets and food. Residents of the camp can access a shower and a hot meal every day at a nearby center run by a nonprofit, but the living conditions in the camp are dire, with only four water fountains, no electricity and the cold setting in. Vincent Cochetel, European director for the U.N. High Commissioner for Refugees, has cited the "appalling" conditions in the camp and called for "proper reception centers." The French government has been forced to supply more toilets, water connections, as well as to pick up trash, after several nonprofits filed a lawsuit against authorities. Dozens of heated containers are also being installed this week.